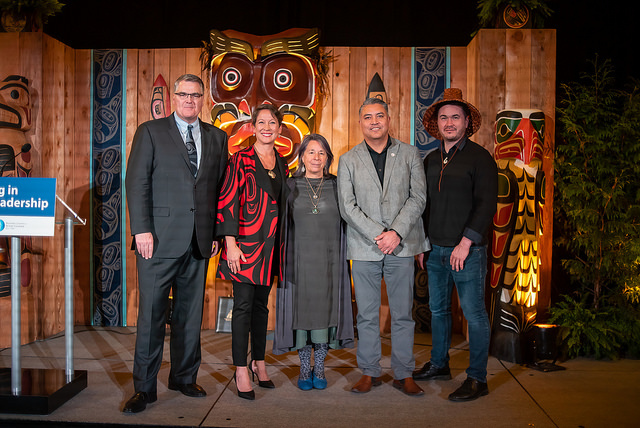 A partnership opportunity for Indigenous post-secondary graduates to develop their business and leadership skills also will provide British Columbia businesses with Indigenous knowledge and perspectives. The partnership between the Province, the B.C. Assembly of First Nations (BCAFN), the Business Council of B.C. (BCBC) and Vancouver Island University (VIU) will match Indigenous graduates of technical, trades, diploma and degree programs with companies in B.C. for a two-year paid internship. The Indigenous Intern Leaders Program is providing interns with leadership skills and training through valuable work-integrated learning opportunities. The initiative is helping to educate and encourage B.C. businesses to cultivate Indigenous knowledge and culture in their practices by creating welcoming, attractive workplaces for Indigenous employees. Both the interns and the companies they will work for will receive mentoring from First Nations Chiefs and business CEOs. VIU is providing logistical support to the partnership, but the program is open to Indigenous graduates throughout the province. Participants must be a B.C. resident, under 35 years of age and have completed a post-secondary education credential, such as a degree, diploma or trade certificate, at a recognized post-secondary institution. The Indigenous Intern Leaders Program is an initiative of the Champions Table, a group of First Nations and private-sector leaders brought together through a memorandum of understanding between the BCAFN and BCBC. The aim of this innovative group is to produce concrete solutions in pursuit of greater certainty, partnerships and sustainable economic development that supports full reconciliation with Indigenous peoples in B.C. During the Indigenous Intern Leaders Program’s initial three years, 150 Indigenous post-secondary graduates will build work experience, leadership, professional networks and peer-to-peer networks at B.C. businesses. Participants will be employed for a two-year period and develop their talent within their chosen field while learning about the sector. British Columbia expects 903,000 job openings over the next decade. Many companies already are struggling to find qualified employees. The Indigenous Intern Leaders Program offers B.C.’s businesses the opportunity to become Indigenous peoples’ employers of choice. The Province is providing $420,000 to VIU to support delivery of the provincewide program for three years. The other partners are providing both funding and in-kind services. Employers will be responsible for intern salaries and other costs of employment. After three years, the program is expected to become self-sustaining. Investing in the Indigenous Intern Leaders Program supports the Truth and Reconciliation Commission’s Call to Action number 92: Business and Reconciliation, and the United Nations Declaration on the Rights of Indigenous Peoples Article 21: Equal Access to Economic Opportunity. Government funding is provided through the Innovative Skills Training Fund (IST), established to facilitate innovative approaches and research in skills training and employment program design and delivery, with a focus on addressing barriers to employment for vulnerable and under-represented groups. The IST is funded through the $685-million Workforce Development Agreement signed in May of 2018 with the Government of Canada. Delivering investments to support co-op, apprenticeship and work experience programs for high school and undergraduate students is a shared priority between government and the B.C. Green Party caucus, and is part of the Confidence and Supply Agreement.